Like wildfire, the story spread globally even though there was – and still is – limited information about the 51 lab-confirmed cases of measles public health officials say are linked to the happiest place on earth. Dr. James Cherry,8 a prominent UCLA pediatrician and infectious disease expert, publicly joined in the blame and shame game, hurling insults at parents declining to give children every one of the government recommended 69 doses of 16 vaccines, including two MMR shots. Why is a big deal being made out of 51 cases of measles reported in the U.S.? It isn’t very scientific to blame pertussis or influenza outbreaks on unvaccinated people. And it isn’t very scientific to blame measles outbreaks on unvaccinated people, either. The inconvenient scientific truth about measles in Disneyland and around the world is that public health doctors do not know how many vaccinated people can be infected with measles, show few or no symptoms and transmit measles to other people.63 Government health officials do not conduct routine active surveillance of vaccinated people to find out if they are experiencing asymptomatic or atypical measles and transmitting it to others. In addition, there are published studies demonstrating that people given live virus measles vaccine can be infected with vaccine strain measles virus and shed vaccine strain measles virus.64,65,66 Health officials do not conduct routine active surveillance of people getting live MMR vaccine to monitor for vaccine strain measles virus infection, shedding and the potential for transmission. Is It Measles or Something Else? And now for the second sucker punch, at least for families living in California: Dr. Pan, the pediatrician politician who lobbied in 2013 to pass a bill restricting non-medical vaccine exemptions for children to attend school, told one California newspaper that he intends to introduce new legislation to do more damage to the ability of parents to weigh the benefits and risks of vaccination and make voluntary vaccine choices for their children.72 Will California health officials take away religious and conscientious belief vaccine exemptions and leave doctors like Dr. Pan and Dr. Cherry in charge of who gets a public education? That third MMR shot is coming to America and so is a massive Pharma-led lobby attempt to demonize and punish76,77 all Americans who defend the human right to exercise informed consent to medical risk-taking, including vaccine risk-taking.78 The calls to strike down those who do not use every dose of the growing list of government-mandated vaccines, is on a fast track.79,80 It will include banning the unvaccinated from exercising the right to get a public education, medical care,81 employment, and many other human and civil rights. 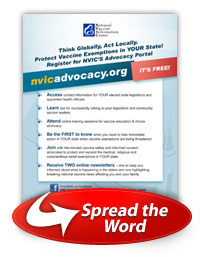 Go to NVICAdvocacy.org and learn how you can take action to protect vaccine exemptions in your state. Learn more about the risks and complications of measles and measles vaccine on NVIC.org. And if you or your child has been vaccinated and the vaccine failed to protect you or caused harm, you can make a report to NVIC and share your experience with others on NVIC.org. National vaccine policy recommendations are made at the federal level but vaccine laws are made at the state level. It is at the state level where your action to protect your vaccine choice rights can have the greatest impact. It is critical for EVERYONE to get involved now in standing up for the legal right to make voluntary vaccine choices in America because those choices are being threatened by lobbyists representing drug companies, medical trade associations, and public health officials, who are trying to persuade legislators to strip all vaccine exemptions from public health laws. Signing up for NVIC’s free Advocacy Portal at http://www.NVICAdvocacy.org gives you immediate, easy access to your own state legislators on your Smart Phone or computer so you can make your voice heard. You will be kept up-to-date on the latest state bills threatening your vaccine choice rights and get practical, useful information to help you become an effective vaccine choice advocate in your own community. Also, when national vaccine issues come up, you will have the up-to-date information and call to action items you need at your fingertips. If you or a family member has suffered a serious vaccine reaction, injury, or death, please talk about it. If we don’t share information and experiences with one another, everybody feels alone and afraid to speak up. Write a letter to the editor if you have a different perspective on a vaccine story that appears in your local newspaper. Make a call in to a radio talk show that is only presenting one side of the vaccine story. NVIC Memorial for Vaccine Victims: View descriptions and photos of children and adults, who have suffered vaccine reactions, injuries, and deaths. If you or your child experiences an adverse vaccine event, please consider posting and sharing your story here. Vaccine Freedom Wall: View or post descriptions of harassment and sanctions by doctors, employers, and school and health officials for making independent vaccine choices.